Savants reckon radiation released by the 2011 Fukushima nuclear kerfuffle has made its way into California's wine. A paper emitted this month by researchers at the University of Bordeaux Centre d'Études Nucléaires de Bordeaux-Gradignan (CNRS) in France revealed that levels of cesium-137 in the atmosphere rose as a result of the reactor accident, judging by Cali tipple tested before and after Japan's level-7 nuclear disaster. It is believed a radioactive cloud released by the Fukushima Daiichi plant made its way across the Pacific and over to California's Napa Valley vineyards, where trace amounts of the highly soluble cesium isotope got into the grapes used to make the region's famed wines. As a result, a typical bottle of Cali Cabernet Sauvignon doubled its cesium-137 activity from about 7.5 mBq per liter to around 15, which is – to use a technical term – sod all, but still quite interesting. 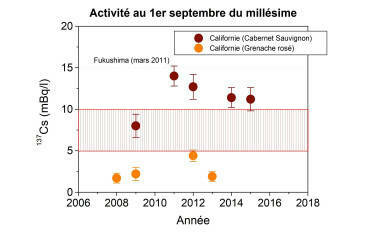 The cesium-137 levels vary by the type of wine, with bottles of rose showing lower concentrations than those of the darker Cabernet Sauvignon reds. Radioactive cesium-137 has been detectable in wines for decades. Thanks to the advent of nuclear weapons and their tests, every bottle of wine made since 1952 has at least some detectable level of cesium-137. The CNRS facility that conducted this research measures the presence of cesium-137 in bottles of vino to verify its age, and snare vintage frauds who try to pass off new wine as older and more valuable stuff. "The advantage of this [measuring] technique is that it does not require the opening of the bottle (a prerequisite for collector bottles) at the expense of a loss of sensitivity and a sharp increase in measurement times," the researchers mentioned. "This technique allows dating for vintage wines between 1952 and 2000, but above all it is very effective for very old vintages: indeed any bottle before 1952 does not, can not contain cesium-137, even in the trace state." To put this in some kind of perspective, while cesium is not particularly lovely to your body, the levels of the stuff we are talking about here are tiny. At the height of atomic bomb testing by the world's powers, the radioactive content in wines was much, much higher than today – and a 1957 bottle of claret would have levels of cesium-137 hundreds of times the amount found now. As you can see from the graph above, levels of the toxic element spiked following early big nuke tests and industry cockups, and then trailed off to low levels in spite of the 2011 Fukushima dramathon. 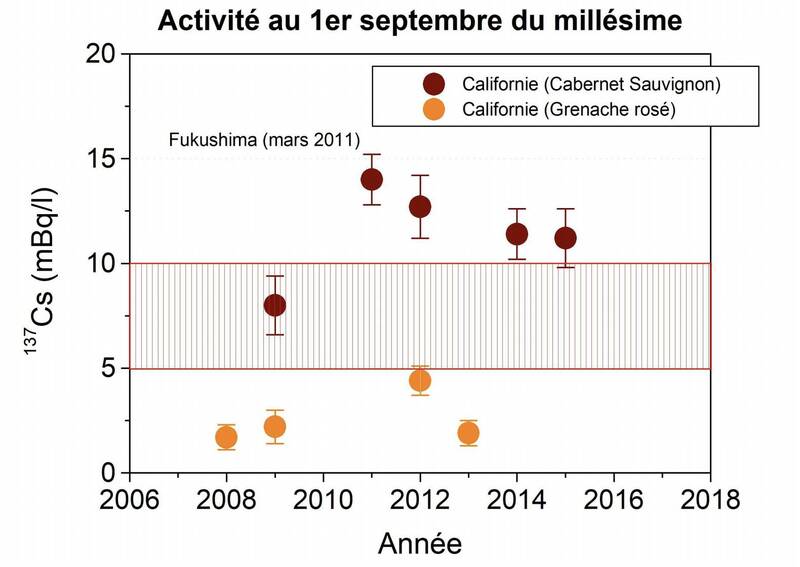 The Bordeaux researchers noted that in the late 1980s, French wines showed elevated levels of cesium-137 thanks to the radiation cloud from the 1986 Chernobyl catastrophe. "As was the case in France's white or rosé wine, Californian rosé bottles lead to significantly lower values than red wines," the researchers noted, adding: "It seems there is an increase in activity in 2011 by a factor of two."